Are you or your child a fan of Marvel comics? Then, get ready to be dazzled by Mad Stuff with Rob which brings you step by step instructional video on how to have a real growing Hulk in your home. Yes, the onset of May brings in superhero themed arts and crafts videos to keep your children entertained in-house safely from the scorching summer heat outside. Okay! What does I mean when I say"real growing Hulk" in your home? Are you confused or anticipating something interesting? Well, see this image below. Hulk: SMASH! Oh, Hulk like explosions like the greeny things you see over my head. They just seems to keep growing like me...err...growl Hulk's hair. Interested? 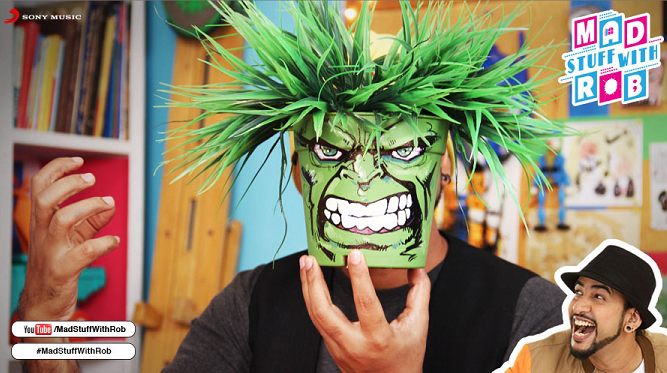 Well, then it is time to see how to make you own hulk head plant holder which is quite easy and fun to do especially with the kids around. It's time to make a superhero! Step 1 - Paint the plastic pot using green acrylic colour with the help of a sponge. Using sponge, dab the green acrylic paint on the pot. You need to paint the whole pot green and by using acrylic paint you will get a nice glossy texture on the pot. Moreover, acrylic paints are water based and are excellent for painting plastic posts as they stay much longer and dries very quickly. 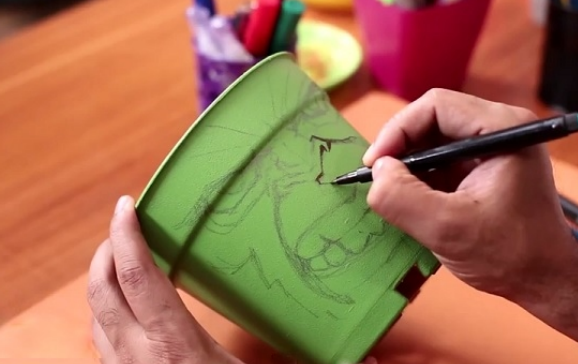 Step 2 - Then, using the pencil try drawing the shape of the Hulk face. It is always a good idea to use a pencil for the design first instead of painting. However, if you comfortable with painting you can always do as acrylic paints easily covers each other well. For kids, it is a good idea to start with the pencil though. 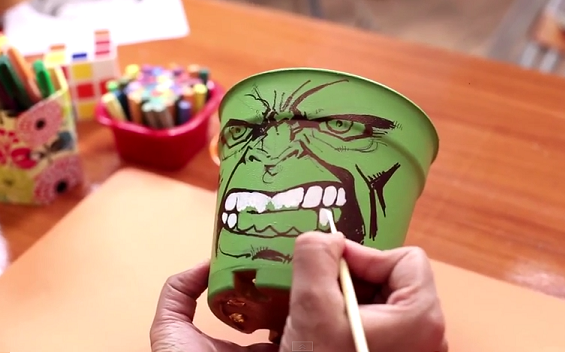 (Note: You will need to follow the instructions given in the above video for drawing the hulk face). Step 3 - Next, add more details using the permanent black marker bringing the pencil design to life. Step 4 - Finally, add the white acrylic paint on the design for painting the teeth and eyes with the help a paint brush. Hurray! Our hulk head plant holder is finally ready. 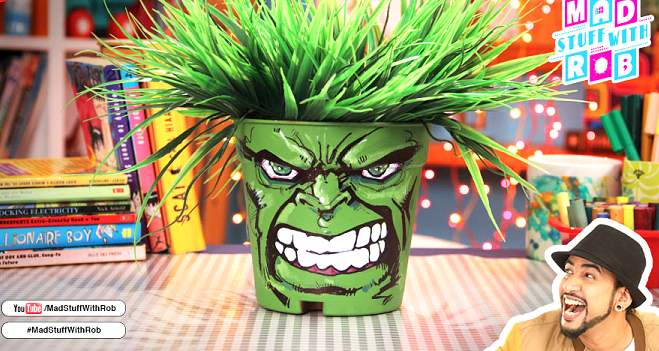 Now, get the kids ready for some gardening by planting some seeds and try growing some real green hulk hairs. Note: To add an extra layer of protection to the acrylic paints, you can spray it with the aerosol water seal and let it dry overnight. Did you enjoy this activity for children? You can subscribe to Mad Stuff with Rob for more such arts and crafts to keep your children busy and entertained at home. This summer make sure to use vibrant colours for your pots. Lengthy hot summer tends to fade the colour soon although you can still repaint the pot. After all, painting plastic pots can be a lot of fun for kids and they can come up with their own creations too. And if you really have made a wonderful creation and wants it to last indefinitely, use your pot indoors. Heyy this idea is so lovely and quite cool too. Wow this was amazing !! (h) You sure are one creative mom ! !